Matthieu Chauvet's record of qualifying for Final 4's makes him a good candidate for a who is who story. What a lot of people do not know is that Chauvet has been coaching for over 20 years. He started his coaching career when he was 14, and apart from two seasons when he coached boys' teams he has always been involved with women's team. He took all his coaching exams and for three years (2005-2008) he was the assistant coach to Corinne Bénintendi at Challes-les-Eaux as well as manager of the basketball academy ("Centre de Formation"). He took over the Head Coach role at Roche Vendée for the 2008-2009 season. His team won the first five games of the season and were the early leaders. Chauvet expected a tough competition and by the end of the season Roche Vendée had to settle for 5th place and did not qualify for the Final 4. In his second season for Roche Vendée, his team started badly with just 2 wins in the first 7 games. But in his manner Chauvet turned things around and by the end of the season the team finished 3rd and qualified for the Final 4. In his final season at Roche Vendée his team went undefeated at home and finished in second place and qualified again for the Final 4. However his three-year contract had come to its end and was not renewed. He finished with a win loss record of 65-29 and two bronze medals. He was appointed as the new Head Coach for Toulouse Métropole Basket for the 2011-2012 season. Chauvet's ambition has always been to coach in the LFB. So he set as an objective a top 4 finish for the regular season. His team finished second with 20 wins and 6 losses, and then qualified for the LF2 Championship match during the Final 4. This was the first time for Chauvet and also Toulouse to qualify for the final match. Despite losing to Perpignan in the final it appears that Chauvet's dreams of coaching in the Ligue Féminine de Basketball (LFB) will become reality. They are just waiting for the FFBB to sanction the promotion. 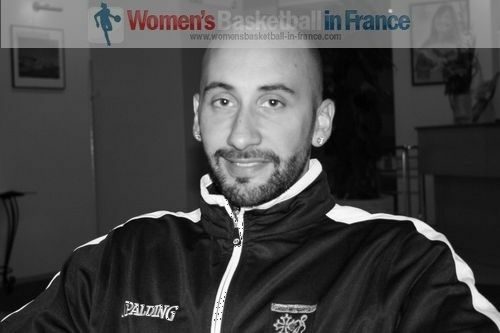 In our series on "who is who" in French basketball we chose Matthieu Chauvet because he has a basketball coaching background and his ambition is to coach in the LFB while being a fan of women's basketball. How has Chauvet developed his coaching style in the last four years? Chauvet is not the same coach of 2008. He has become more mature and reflective in his actions on the court. However what has not changed is his energy and enthusiasm for the game. Chauvet explained that apart from growing four years older, he had had time to stop and think about where he was going with basketball. So naturally he believed that four years in the second division helped him to develop his personal vision on how basketball should be played. As a consequence he has a better understanding on how to build a team that functions and at the same time to stamp his philosophy and vision on the team. Carrem Gay (left), an American player in his team this season, pointed out how ChauvetChauvet helped her with the transition from playing in the LFB to LF2. She also said how he had helped her to become dominant and a leader for his team. Darline Nsoki (right) remarked that for the whole season she had been working on her long distance shots in training and that how her coach encouraged her to shoot the ball and not worry if it did not go in because the time would come when the ball would drop. As it happened during the semi-final, she hit two big shots in the semi-final. She also said that even when things were not going that well during time-outs he just encouraged them and it worked well for the team. However one of the biggest compliments came from Héléna Ciak, who had played under Chauvet at Roche Vendée. She said that she had learned a lot from him last year and had a lot to thank him for. All these players more or less confirmed that Chauvet's vision for how they should be playing the game had worked for them in different ways. As far as Chauvet is concerned, basketball in LF2 is different to that one played in LFB. Hence the team construction process is not the same. It is this understanding that enabled him to make the necessary adjustments for the players from Toulouse who had played in the LFB the previous season. Chauvet does not view his record and success as special, he just sees it as an experience and lessons learned from coaching in LF2. As well as building a new team, he has had time to learn from his mistakes and work on his own personal development. He even went as far as analysing what he did during the 2010 and 2011 Final 4's in which his team lost in the semi-final match in order not to repeat the same mistake again. All the same Chauvet believes that his knowledge of the league (LF2) today gave him a little advantage in preparing Toulouse getting to the Final 4. When you talk about youth development, Chauvet's eyes light up. He loves working with young players, that is what he did in the past but today he is less hands-on in this area because his assistant is responsible for the basketball academy. However with only two players older than 23 in his squad, he is working with a young dynamic group of players that still requires development so he is happy. He also allows five players from the academy to also train with his first team. He admits this is essential as the development of youth players is an essential element in building the future the "who is who" of the sport. center>Who is Who in Toulouse Métropole Basket - What do they do? Unlike at Roche Vendée, Matthieu Chauvet's role at Toulouse is well defined. He wears the cap of Head Coach only with an objective of getting the club back into the LFB in two years. His assistant Xavier Noguera runs the Centre of Formation while the President of the club Dominique Granseigne deals with off-court activities. 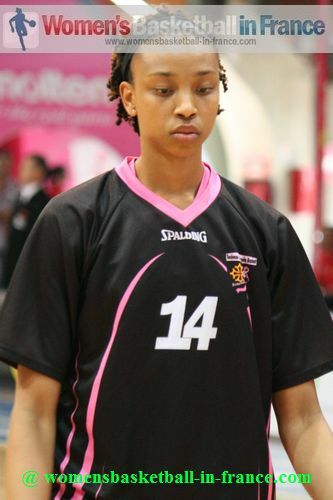 In addition Toulouse have maintained the professional structure of the LFB with a complete back-room staff (strength and conditioning, physiotherapists, etc). All the players who are not part of the Academy are under professional contracts (with some of the players having student release contracts that enable them to attend classes). This structure has meant that Chauvet was able to work on a timetable that included two training sessions per day, a luxury he did not have at his former club.